Research like this is new and growing so I thought it would be interesting to look at some recent technology approaches to homelessness. The Department of Veterans Affairs announced within the last few days a new Innovation Initiative competition to a create an app that will “provide easy access to resources that the homeless need, when they need it, and where they can get it.” Project Reach (Real-time Electronic Access for Caregivers and the Homeless) challenges contestants to create a free and accessible app that shares real-time information on where someone can meet basic needs such as a bed or place to eat. 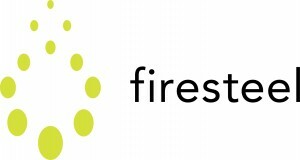 This competition entices creative talent by offering $10,000 to five finalists and then $25,000 to the final Grand Prize winner, announced on November 9, 2012. I am definitely tracking this project closely as I’m fascinated to see what comes of it! 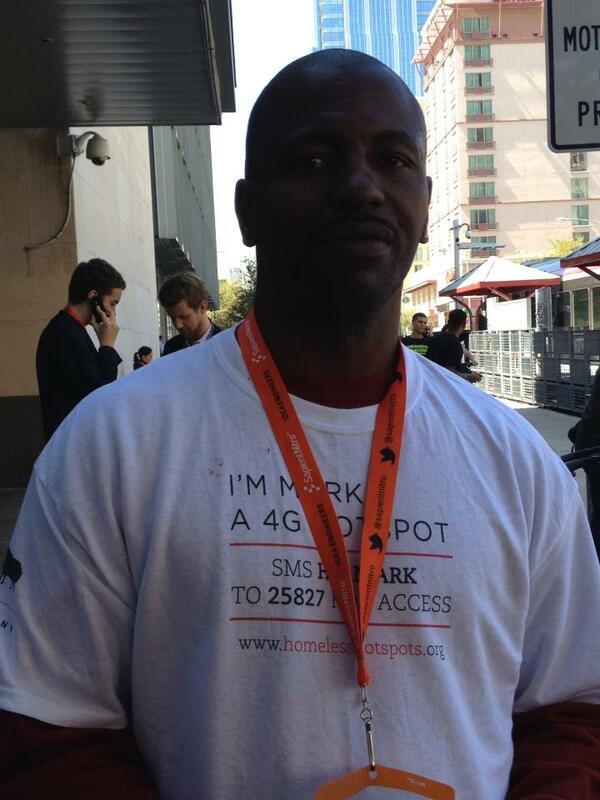 Homeless Hotspots, an innovation initiative by BBH New York, made big waves at SXSW this year. A modern take on the street newspaper model, individuals experiencing homelessness volunteered to sell wireless access during the techie interactive portion of the festival. 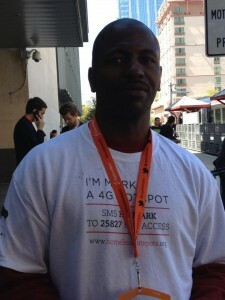 The hotspot collaborators wore t-shirts that identified them as “hotspots” and people could pay what they wanted for a password that gave them access to wireless internet. The suggested price was $2 for 15 minutes and all money went towards the 4G network vendor. The advertising agency, BBH New York, partnered with a local Austin shelter, Front Step Homeless, to make this happen and provided a means of donating to the shelter as well. So here’s my personal take on it. I agree that objectifying and commodifying a human being is an awful thing. However, I don’t believe that is what is happening here. Why? Well, any article or writer that actually asked a Homeless Hotspot their opinion on it got a very different take. 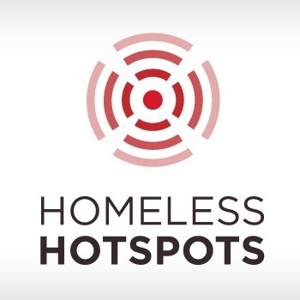 Those individuals experiencing homelessness who volunteered to be a hotspot only had positive things to say about it, including the opportunity to talk to people about their situation who probably otherwise wouldn’t have even noticed them. Not only did this project grow more awareness of an often invisible population and need, but it encouraged interactions that allowed humanity to actually shine through. Critiquing is all fine and good, but whose voices are critiquing? In this case, I would say that the loudest protesters failed to actually go to the source and ask the Homeless Hotspots what they thought. In failing to recognize the voice of the homeless participants, the protestors only contributed to the very thing they were critiquing–objectifying and de-humanizing these individuals. This initiative is in its pilot phase and recognizes that it has limitations and needs to be tweaked more. I for one, hopes it stays around enough long enough to grow and improve! Web games are now popping up that challenge us to think through social issues and educate the player on a lot of barriers that exist in society. Spent is a simulation game that places you in someone else’s shoes and steps you through challenging decisions and barriers that can often cause homelessness. Visit playspent.org to try the game yourself. I was forced to live on a tight budget for a month thanks to a low paying job. I found myself having to choose between medicine for my child and car repairs so that I could drive myself to work. I then sacrificed my healthcare needs so that I could afford to pay rent and still ran out of money by day 20. Yikes! Created by Urban Ministries of Durham and the ad firm Mckinney, Spent was created to build awareness and compassion for those experiencing homelessness. The New York organization, Pathways to Housing, combined digital art with advocacy and a mobile way to donate. The housing organization projected the image of a shivering man sleeping on the sidewalk in downtown Manhattan. 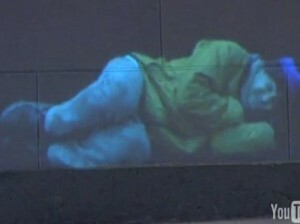 Text was also projected on a nearby wall encouraging viewers to send a text message to help him find shelter. When someone sent a text, a new video loop kicked in showing the man getting up and walking into a new apartment. A visual representation emphasizing stable housing first. When a person texted, they received a message in return asking if they would like to make a $5 contribution, easily added onto their cell bill. Unfortunately all videos of the light display that I can find anywhere are no longer available. It was apparently taken off YouTube or relocated since the original wave of attention in 2010. I am disappointed not to be able to see it for myself! 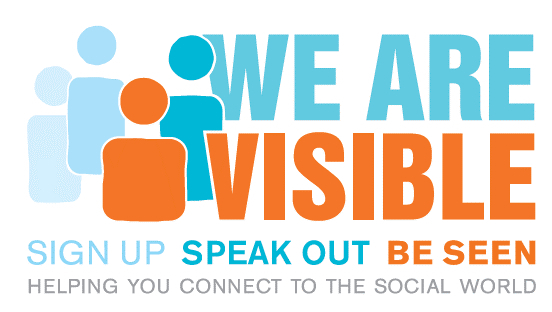 We Are Visible uses social media to build a support community and empower people to share their stories and perspectives. Their website walks visitors through how to access and use social media and their Facebook page is quite active. Invisible People TV is another project to bring more visibility to people who are often invisible. Their blog and YouTube channel show how social and digital media can give a powerful and honest voice to those who many otherwise not have one. Then there’s us! An issue-based community, online and off, we are combining social media and online advocacy tools with a commitment to end homelessness. Have you heard of any other technologies that are tackling homelessness? I’m curious to know!